It is only the second time in the history that a disease is being eliminated in India through immunisation after smallpox in May 1980. 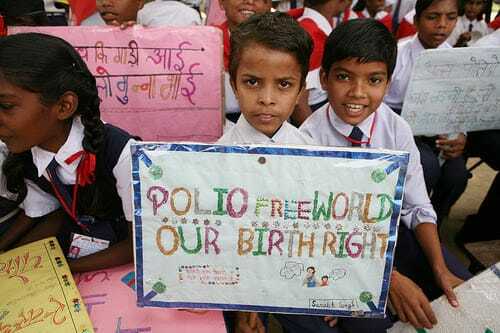 However, officially the World Health Organisation (WHO) will certify India as polio-free on February 11 after the last of random samples picked up have been be tested. India’s being declared polio-free is particularly important because it was the only country in the South East Asian region with polio cases.India carried a large burden of polio disease but has made impressive progress in the past 35 months. According to an article in the Hindu, the number of polio cases came down from 741 in 2009 to 42 in 2010 and just one in 2011 – from West Bengal. No polio case has been reported in the country since then. India won the war against polio through the intense Pulse Polio Immunisation programme under the Global Polio Eradication Initiative in 1988 which over 17 crore (170 million) children were vaccinated in each round of vaccination with the help of 24 lakh (2.4 million) vaccinators. The Pulse Polio Immunisation programme was launched in India in 1995. Children in the age group of zero to five years are administered oral polio drops during National and Sub-national immunisation rounds (in high risk areas) every year. About 172 million children are immunised during each National Immunisation Day (NID). To read more on India’s pulse polio campaign , click here.